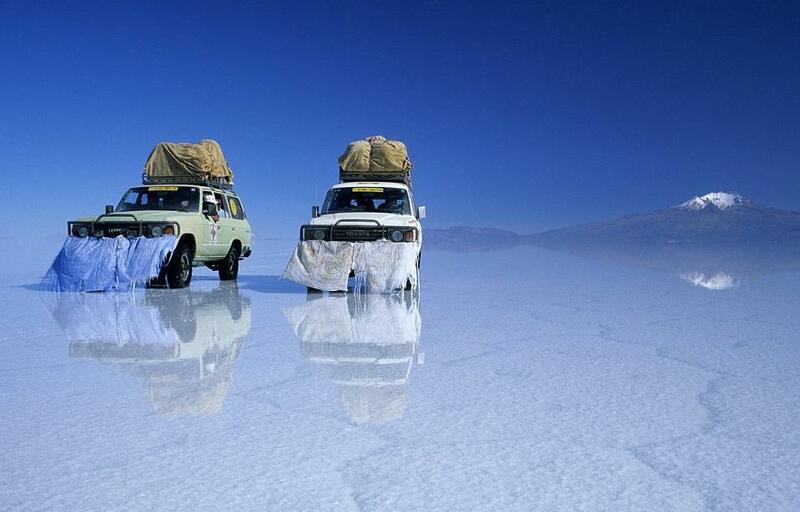 The Salt Flats of Bolivia also known as Salar de Uyuni are the largest salt flats in the world at 4,086 square miles. During the wet season (December to March) the flats are covered by a layer of water a few centimeters thick making it the worlds largest mirror. During certain times of the year it is also a breeding ground for pink flamingos. It’s said that people often lose their sense of direction here. When you look around everything looks exactly the same. For this reason, certain people might become anxious and panic. Getting lost in any desert is no joke. It is necessary to take certain precautions that might include bringing a compass, familiariizing oneself with specific landmarks, going with a guided tour, or just having some common sense. Its amazing how far some common sense will get you these days. Previous PostSuspension in my kitchenNext PostSuspension is in! Hi Sara – we are wondering what you do about first aid. Will you and Dean take a first aid class before you leave for your trip? YES! We will be taking a heavy duty first aid kit! My sister is a nurse and she will be on speed dial. JK…kinda. Haha.